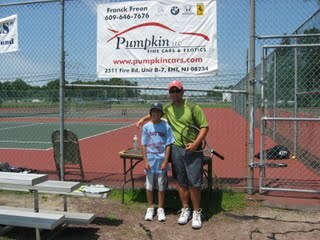 We at Pumpkin Fine Cars & Exotics just wanted to take a moment to thank Joe Scalfaro and his gang at Scalfaro tennis for a wonderful summer of youth tennis clinics and tournaments at Holy Spirit High School. Of course, we are proud to announce that our 11 year old "Pumpkin", Harrison, won the 12 and unders in the first and third of Joe's tournaments and earned the runner-up spot in tournament two. Read about why we call the business "Pumpkin" at our website menu item Meet the Staff, under Gina Freon (Mom). The family started enjoying tennis thanks to Dad's passion for the sport. Franck Freon, veteran race car driver and owner of Pumpkin Fine Cars & Exotics not only loves tennis but used it for part of his training (eye/hand) for driving competitively. He was a pretty good player until he broke his achilles tendon (many of our loyal customers and friends rememeber that nightmare!!) Now, it's up to his son to carry the flag on the tennis court. Bravo to Harrison and thank you to Joe Scalfaro and his assistant Brian! Welcome to the Pumpkin Fine Cars and Exotics blog. In today's version of our car of the day we feature a 2003 Ford Mustang Convertible. This fantastic pre-owned car is white with a tan soft top on a tan leather interior. With a 6 cylinder 3.8 liter engine, this pristine white Ford Mustang comes fully-equipped with 6 Disc CD Changer, power convertible top, power locks, power seats, power windows, and cruise control. This is a certified Pumpkin Car that deserves a good owner. All Pumpkin Cars are available to all customers for a no-hassle, no cheesy sales pitch, stree-free, free test drive! Come visit our friendly dealership today and talk to the most honest, most knowledgeable people in the used car business! 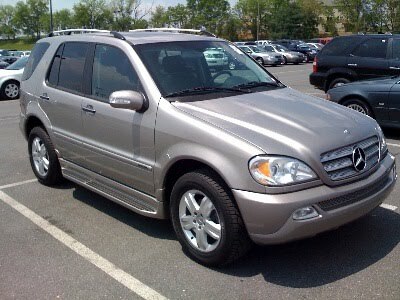 Welcome to Pumpkin Fine Car and Exotics blog. Today's car of the day is a beautiful 2004 BMW 530i. Black on black leather, this beamer from Pumpkin Fine Car and Exotics comes fully loaded! This pristine BMW from has the cold weather and premium packages including power/heated seats with memory positioning, alloy wheels, auto-dim rear view mirrors, power mirrors, power windows, power locks, power seats, moonroof, cruise control, and CD player. Like all Pumpkin Cars this BMW is certified and ready to enjoy. Come for your free, no pressure test drive today! We are also open Saturdays from 10-3. We look forward to meeting you. We would just like to take a moment to share our appreciation for Darrell Merrill and his valuable crew at Darrell's Auto Repair Shop in Egg Harbor Township. Darrell's is located next to Pumpkin Cars and Exotics at 2511 Fire Road in Egg Harbor Township, just 1/2 mile north of Delilah Road. Darrell's was recently recognized for helping a woman in need through Child Inc., a safe house for victims of domestic violence and their children. Darrell first got a car donated by the 1-800 Charity Cars organization that he and his crew then restored to safe condition. Pumpkin Cars are serviced before and after sale by our good guys at Darrell's and we just wanted to say Bravo! Welcome to Pumpkin Fine Cars and Exotics blog. For today's car of the day, we at Pumpkin Cars feature a 2001 BMW 325i. Driven only 20,600 original miles, this is a beautiful BMW with a black exterior on tan leather. This like-new beamer comes equipped with a 6 cylinder 2.5 liter engine, heated seats, CD player, alloy wheels, power windows, power locks, moon roof, and cruise control. Contact us by email at [email protected] or call us today at 609-646-7676. We look forward to serving you.